How do the International Artists see us? This is the first time that Beata Szechy's the Hungarian Multicultural Center exhibit was held at the Hegyvidek Gallery. The most beautiful works were exhibited from the 2009-2010 residencies at the Jokai Club by the HMC. Every year the HMC organizes a closing exhibit from the works that inspired the artists at the residency. This is the first time this tradition has been carried out at the Jokai Club, where the artists reflect upon their experiences in Hungary. This time they provided more exciting portrayals of us because more countries were represented by the artists. Most of them came from the United States, but artists also came from Singapore, India, New Zealand, Ireland, Japan, Netherlands and Great Britain. Most of them were first time visitors, but many of them have a Hungarian background and came to discover their roots. At the opening speech Dr. Katalin Geller, art historian, emphasized the variety and quality of the works. The HMC's goal originally was to introduce our country to the foreign artists and to the heterogenus American culture. The first residencies were held at Lake Balaton and the first exhibition held at Pesterzsebet Gallery, where pop-art, photographs and graphics were exhibited. Today the media and style are varies. At first mostly young artists applied to participate; later professors and well known artists came to the residencies program. There still we can see traditional techniques as tush, charcoal, and paintings. At the residency the different international artists achieve a cohesiveness of purpose yet use new techniques and compete with each other, as pointed out by Katalin Geller. The finished works are reflections upon the Hungarian influence. This exhibit includes a type of sociology: a print of the Hungarian society through the artists eyes. 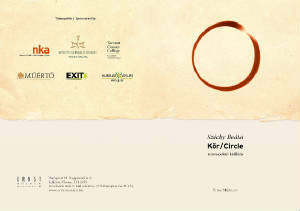 The exhibit will remain open until October 5th, Jokai Club, Hollos u. 5. Many times artists arrive looking for their roots at the International Artist Residencies that is organized several time per year by the HMC. We can see images from Lake Balaton or Budapest with the artists own style and new techniques. The exhibition welcome speech was provided by Dr. Katalin Geller, art historian. She said that in the works we can see the artists' humorous, sometimes shocking opinions about us, or give a message to cause the viewer to think. We have interviewed Beata Szechy, artist and the founder of the HMC's residencies. Not long time after my arrival in 1987 to San Francisco I founded the HMC, a non-profit, cultural organization. I have two homes, I spend half time in the United States and half here. How could the public know you before you left? I was an artist before I left, also I was the vice-president of the Young Artists Studio from 1982-1986. How did you get the idea to organize an International Artist Residency? An American artist asked me to organize for her a working place in Hungary in 1995. Because I knew people I was able to help her, exhibit her work, and indeed she gave me the basic idea. I had a small house close to Lake Balaton between the beautiful hills, and the residency started from there. How fast has this project developed? Fast. I can say that the last few years close to 500 people write us and apply per year from everywhere on the world. A jury selects the participants. At the beginning 20 artists were invited in the same group, but I learned that 4-5 artists are more optimal. This year we organized 5 groups. At the end of the sessions the artists donate one-one piece to the HMC. In exchange we organize several exhibitions and publish a catalogue with images and info about every artist. Our next exhibition will be at Duna Gallery, opening on December 8th, where we will show selected artworks from the last 5 years. Who are exhibiting at this show? Artists are from Japan, India, The Netherlands, Ireland, New Zealand, Canada and the United States. One of the artists, Izumi Ueda Yuu, from Japan/Singapore, created an object piece from water bottles tops to portray the Hungarian Crown. Neil Chowdury of Syracuse, NY provided his photo prints as unique pictures of the Trabant or a women in fur coats in the summer. Daniel Temkin of Astoria , NY showed on his work the American influence here as Coca-Cola, KFC, McDonald’s. It is very interesting Michael Thomas of Chicago, IL, created a video composition, Hyppolit in America, with a lot of humor in it. Is there anyone who is coming back again? Yes, many artists came back several times. Most of the artists fell in love with out country, especially with Budapest. They said that the city has a special cultural radiance. May 22, 2009 by S.M. At the Ferencvarosi Gallery exhibit, the visitor can observe a special feel emerging from and influencing the art works. There are American, Portuguese, Greek, Irish, Canadian, Italian, Indian artists, mostly painters, photographers, and installation artists. The artists who come here in 2008 bring their own world and form of expression and can enter into dialog with the others, thus gaining a new perspective of their own art too. AIR is an international meeting point for the arts. The summer and winter art colonies of the Hungarian Multicultural Center, which have been in operation for quite a few years now, belong to those flourishing artist' communities that bring artists of various traditions and cultures together. Most of the work reveals new messages and meaning, inspired by the AIR/HMC, International Residency experience. The exhibited works are special, meaningful, and move the viewers imagination. For example, Rudee Westphal from America made paper reliefs combined with poetry. Hannah Verlin's objects entitled as "Preserves" shows hand cut paper trophies in jars symbolize Hungarian history. "You and Me" by Holly Boruck combines the intricacies of the human body with seed pods and seedling structures. She think of the human body as a kind of complex seed pod, where there is a latency for a vast array of possibilities - positive to negative and all shades in between. Lana Gabor came from Canada, her "Local Foreigner" photographs shows herself as a person of Chinese and Hungarian descent at her father’s homeland, Hungary. 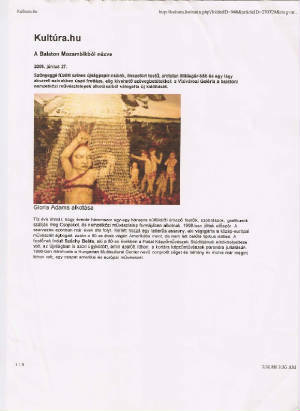 Louis Denes, Canada, installation is environmental installation and Amelia Schembri, Canada, "Madonna" postcard installation is including their Hungarian experiences. Terra Fine's charcoal drawing, “Singing for Change (Budapest)”, is a subtle social commentary about Western influences on world cultures, corporate responsibility, and the real price of globalization. Marlene Vinha, Portuguese, used stamp to create a pattern, her work not only very creative, also has a kind of political message. Jenna Spevack, US, "Red and White Danube" painting message is that we need to save our waters. Andreas Papanastasiu came from Greece, his work based on visual "accidental" presentation, he has poured pigment on hanging canvases, his works represented on the poster and invitation card the exhibition. Lisa Erdman's photographs with the uterus has many symbolic meanings. Megha Joshi from India has used in different techniques the image of paprika as a symbol of Hungary. Luca Armigero, Italian artist installation include 3 canvases, neon lights, gas-mask, and DVD titled as "St.Istvan Overture". Oliver Irvine, Ireland & Amy Eloise Thomas, Great Britain aim to create situations of uncertainty, confusion and clarity by constructing interactive environments. Cara Tomlinson from Portland inspired by the colors of Budapest as shows her works title, "Color Mine: Budapest", it is a series is small paper cuts in abstract form. The Ferencvarosi gallery in Budapest is full of art created by people from all over the world. Countries such as Canada, India, Greece and many others are represented by the works that decorate the walls. The artists themselves were part of an international artists residencies program and the exhibition is a show of what they created while living in Hungary.Since 1995, Beata Szechy has been organizing the International Artists in Residencies program, which brings emerging artists from all over the world to live in Budapest. As an artist herself, she says she thinks it's important to give artists the opportunity to work on an international scale. My goal, really, is to make an international exchange, she says. To give the opportunity to artists to exhibit internationally and bring their culture to this country. The program runs all year, but with different groups of artists arriving at different times. The winter and summer residencies last for about a month, whereas the spring and fall sections run for two weeks. Exhibit of pieces by international artists Lana Ing Gabor, a photographer from Alberta, Canada was one of the program's most recent participants. She says she was drawn to the program due to its multicultural nature. While participating in a cultural exchange is a popular reason for artists to participate in the program, there is more than one reason they choose to take part. Artists also learned from their envinew ronment. Szechy says that each piece of artwork shown in the gallery has its own unique story. Most of the artwork here shows the influence that the artist got in Budapest. For example, Megha Joshi from India painted the paprika that hangs in the market hall in Budapest. I felt a kinship with people around, yet I felt like the odd yellow chilli in a bunch of red ones, she said in an email interview. "Same same but different" by Megha Joshi. Szechy says that some artists find their inspiration in their own background as well as their new surroundings. Many artists are interested to come because their grandmother or grandfather or mother or father is Hungarian, she says. When [the artist] grew up somehow they became interested in their background. This is certainly true for Gabor, whose father is Hungarian and mother is Chinese. Gabor explores her background in her photos shown in the gallery, which are of her in traditional Chinese dress at different places around Budapest. She says that living in Hungary allowed her to better understand her family. My Dad's side of the family is Hungarian so it helped me to kind of understand their little quirks and the way they do things. Gabor dressed in traditional Chinese clothing in Heroes Square. Szechy says the program has really become popular, with over 500 people applying last year. However, due to the economic crisis there weren't as many applicants this year. Szechy says the program gets to be quite pricey, as all expenses are left to the artists. However, the costs do not seem to be an issue for participating artists. Joshi says the opportunity to create art in Hungary was important to her because of the opportunity to encourage cultural understanding between countries of the world. Programs such as these go a long way in promoting cultural understanding in a shrinking world,\'d3 she said. Art becomes a tool to promote peace and harmony-perhaps the most important human task. We see a carpet from paper, a broken-faceless Mickey Mouse and a sensitive frontage with unreadable text's all exhibited at Vizivarosi Gallery from the selection of the International Artists Residencies. Painters, sculptors, graphic artists and artist's from other mediums, all come from abroad to work for one month at the HMC's AIR. The residency has existed more then 10 years. To become a reality, the Residency needed a cultural ambassador -- a woman, one who knows all the Central-European art system secrets, one who left for America at the end of the 1980's and did not changed to a typical Dallas inhabitant. This woman is Beata Szechy, who started her artistic career as a painter. She was the Vice-President of the Young Artists Studio in the 1980's and in the New World she has continued on the same idea as here in Hungary: to help emerging artists to work and exhibit abroad. Beata founded the HMC in 1990 and in few years she came home, along with American and European artists. In the AIR, artists come to work and be part of our culture from diverse areas such as Japan, Australia, Mozambique and other parts of the world to Balatonfured, Csopak and Budapest. The AIR is a competition, with an application process and a jury that carefully chooses selections between the many artistâs submissions received. At the Vizivarosi Gallery exhibit, the visitor can observe a special feel emerging from and influencing the art works. There are American, Portuguese, Australian, Turkish, Scottish, German, Canadian, Italian, Japanese and Swiss artists; mostly painters, but there are sculptors, digital printers, installation artists and many more. Most of the work reveals new messages and meaning, inspired by the Residency experience. woven-paper-carpet has timeless stories; Robyn Kinsela documented a landscape from Lake Balaton created with frontage techniques. Between the several work Janine Haard's very sensitive work is the focal point, very strong work. Just one leave from human hair and horse hair created with airy vain. This work looks like as history of the nature after the humanity on the world. 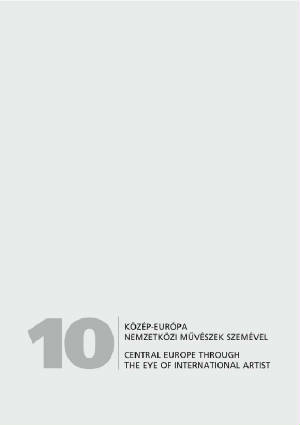 "Central Europe Through the Eye of International Artists". It contains 200 photographs as well information about the artists in English and Hungarian. The official introduction of the book will be on August 2nd at Gombas Kuria, Balatonfured. Opening speech by Dr. Istvan Boka, mayor and introduction by Sárköziné Hajni. The books are in the collection of the National Library of Hungary, at the library of the Ludwig Museum, Mucsarnok-Budapest, Kogart Gallery, Vizivarosi Gallery, US Embassy-Budapest, City Library-Veszprem, & City Library-Balatonfured. The book includes all participating artists at the HMC's residencies. Introductory writing by Dr. Geller Katalin-art historian. The book cost $16.00 + shipping and handling $4.00. The HMC is an award winning 501©3 non-profit organization dedicated to promoting international art and the understanding of world cultures, through high quality art exhibitions, cultural exchanges and related educational programs. The mission of the HMC is to support artists and strengthen the arts in their vital role in the lives of people and communities. -- book was published on the occasion of Beata Szechy's retrospective exhibition held at Ernst Museum. First publication about famed American-Hungarian photographer John Albok, entitled as "Through The Eye Of The Needle". It contains 60 rare photographs as well as insightful information about this exceptional artist in English and Hungarian. Published by Hungarian Multicultural Center, 1998. "To fulfill your creative ideals. It is start to the road of art! Test for the eye to sharp seeing. For the mind to express his sensitivity! Photography separate beauty from wrong doings. Friendly relationship to your love one. A way to our human brotherhood. Registering and inspiring a better way of life. Expression of greatness of your country! Photography is part of the business world. To fulfill your fantasy (for admiration). Connection is a good friend always! Never over-estimate your work. Do always your best in competitions. Never lose your spirit - keep going on your road. Photography is part of your life - don't waste it. Pay-off is if others honor your work. You are on the road of art. Art is the highest honor given by Almighty God. And follow that road throughout photography." 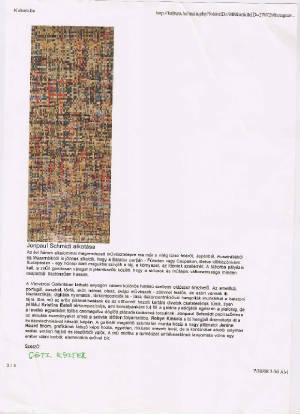 The Metropolitan, Getty Museum, National Museum of Budapest and other museums collected his work. The John Albok photographic exhibition held at the Budapest Gallery from November 27- February 1, 1998.